Weather Policy: We will make every effort to deliver your jump when weather reports are uncertain, or inclement weather is actually occurring. 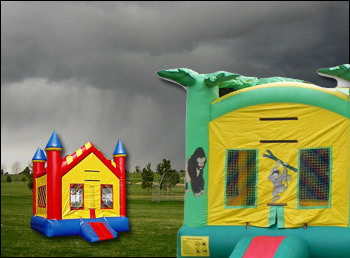 As a general rule, we do not set up in extreme weather conditions such as heavy rain or high winds. We will call you 24 hours before your event to confirm your reservation and discuss options in regards to impending weather conditions. If we do not deliver because of weather conditions you will not be charged. If you decide to proceed with your order and weather conditions change, you will be charged full price.